Acupuncture is an important part of Traditional Chinese Medicine, along with Chinese herbal medicine, Tui Na (orthopaedic massage) and Qi Gong (meditation & energic healing). With a history of almost 3000 years it is still used extensively today to treat literally millions of people around the world. Acupuncture affects the physiological functioning of the body by the insertion of fine needles into particular reflex points all on the body. Because it is a primary health-care system in itself, acupuncture can be used to treat most health problems, ranging from colds and flus to neck and back problems to insomnia and chronic fatigue. Medically, acupuncture works by regulating various systems in the body - hormonal, nervous, immune, circulatory, muscular, etc. 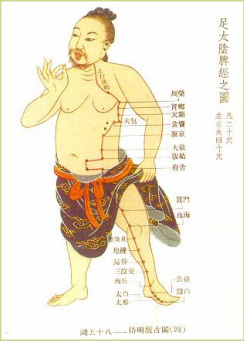 In traditional Chinese medicine theory, acupuncture regulates the flow of Qi (pronounced chee), a type of unseen energy or electro-magnetic force traveling in a system of channels which connect acupuncture points to tissues and organs. Qi takes on many forms in the body, and is the force that warms us, digests our food, moves our limbs and basically keeps us alive. When the Qi, blood, fluids or spirit are somehow affected, the result is pain, discomfort or disease. Acupuncture can affect the flow of Qi in the channels and organs, thereby affecting hormones, nerves and muscles, immunity, circulation and so on. Ear, nose & throat disorders: common cold, sinusitis, tonsillitis, hayfever, rhinitis and tooth pain. Respiratory Disorders: Acute bronchitis and bronchial asthma. Gastro-intestinal Disorders: Gastritis, indigestion duodenal ulcer, hiccoughs, colitis, constipation and diarrhoea. Eye Disorders: Acute conjunctivitis, central retinitis, juvenile myopia and milk cataract. Neurological & Musculo-skeletal: Trigeminal neuralgia, headache and migraines, facial palsy, shingles, peripheral neuritis, post-stroke syndromes, Meniere's disease, neuralgia, bladder dysfunction, frozen shoulder, tennis elbow, sciatica, lower back pain and osteoarthritis. In addition to this list, other problems commonly treated include menstrual, menopausal and pregnancy related problems, stress and depression, Chronic Fatigue Syndrome, sports and other injuries, aching muscles and help with nicotine and other drug withdrawal. Chinese medicine treats disorders via imbalances, so even if your symptoms do not amount to any particular syndrome, they may well be treatable by acupuncture. Some people will never try acupuncture because they think it will hurt, even if they are suffering a chronic and painful condition. Some sensitive patients do feel some discomfort when the needles first go in, but most people are pleasantly surprised at how comfortable acupuncture therapy is, often falling asleep on the treatment table. The needles are generally between 0.2 to 0.25mm in width - small enough to pass through the bore of a hypodermic needle! They are inserted quickly to minimise skin pain, and when correctly stimulated, there is a feeling of tingling, mild cramping or an electric sensation at the point. How deep the needles are inserted varies from few millimeters to a couple of inches or more depending on the size of the patient and where the point lies on the body. DO ACUPUNCTURISTS HAVE TO STUDY IN CHINA ? Australia is leading the western-world in its availability of university based degree courses in Chinese medicine and acupuncture, and most of these institutions have affiliations with Cinese Medicine teaching hospitals to provide an opportunity for post-graduate study. Chinese medicine practitioners are now governed by new legislation passed by the Victorian government, preventing unqualified people from calling themselves Acupuncturists or Chinese Medicine practitioners. However, there are still plenty of short-cut courses available in China or other exotic places, especially popular with GPs, so someone trained in China may or may not be up to the standards set by the Victorian Chinese Medicine Registration board. DO ACUPUNCTURISTS ONLY USE NEEDLES ? Although most acupuncture treatments will involve the use of needles, acupuncturists use a variety of other complimentary techniques in the clinic. These include moxibustion (warming), electro-stimulation, cupping, massage and Chinese herbs. Herbs may be needed in conjunction with a course of acupuncture to enhance the treatment. Traditionally, herbs are mixed acording to individual requirements, boiled up and taken as a tea. Many ready-made formulas are now available in pill or tablet form, making them much easier to take. The number and frequency of treatments depends on how severe and long-standing the condition is, and how well each patient responds to therapy. Four to twelve treatments will generally provide lasting relief for most chronic ailments. However, some acute problems may only require a single treatment, and some degenerative problems dozens. You will be given some idea of how you should respond in your initial consultation, and certainly experience an improvement in your first few treatments. Because acupuncture regulates dysfunction, there are seldom any side effects from treatment. In a few cases some symptoms may seem worse for a day or so before they improve, and many feel very relaxed after a treatment with a sense of well-being that may last for days. In other cases seemingly unrelated symptoms may disappear without direct treatment.